Anyone can make a succulent garden, but if you want a really really good one, you have to go to Sassafras in Rochester, where I learned everything I know. :) I used to love making them when I worked there. We always had them for sale in the store. Aww, now my mind is wandering back to the shop in all its amazingly designed and lovely smelling glory. How I miss you Sassafras! The one I made tonight is from Home Depot succulents, a vase from AC Moore and a few materials I collected from the wooded area outside our apartment. I selected three succulents (3.99 each) of varying sizes and heights. You want your succulent garden to be interesting, so make sure the plants you pick aren't all uniform. Fill the container not quite halfway with dirt. It looks more interesting to have the plants nestled down inside the vessel you're using. Think terrarium-style! Set your first succulent down inside. The one you see above is called Echeveria, and you shouldn't touch the leaves with your fingers because it will leave a mark. 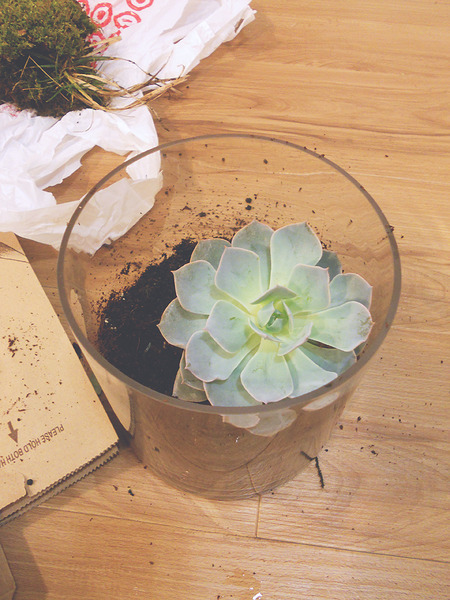 Grasp the succulent from the stem only and be gentle--but don't worry if you lose a few leaves in the process! If your succulent has two stems, divide them up to find the best arrangement! Pull them apart at the roots gently and get rid of some of the soil before you place in your desired spot in the garden. Varying heights add interest and a sense of depth. But I noticed there was a little spot for the other half of the tall guy. Carefully, I placed it in and packed soil all around so he'd be secure. Then it was time to accent with moss and a few little stones I found! Succulent success! One thing Maura taught me is that an arrangement ALWAYS has a "front". I decided this angle was the front of mine. I liked the differing depths and the peeks of moss and stone. Everything looked right in little succulent world. Here's the back of my garden. Do you see a little secret planted with the succulents? I've had my eye on these mini letters at Michael's for a little while now. And who couldn't use a reminder to "GROW" every now and then? Unfortunately, I don't think I can sell this product in my etsy shop due to having no idea how to ship it. There's no way I would put this baby in the mail! Feel free to contact me directly about buying it if we know each other and could arrange delivery at some point. :) For now, it lives happily in our apartment and I don't mind one bit!